Note: This product is not kept in regular stock. Please check for availability before placing an order. The MuLogic DSL-4608.Eth is a modem for high speed transparent Ethernet bridging over unconditioned metallic lines. Using cable of 0,5 mm (AWG24) copper wire gauge, the modem has a reach of over 12km at its lower rates and will operate at a rate of 4608 kbit/s using 2 pairs of copper over distances up to 5km. At larger wire diameters the reach is even longer. The modem offers a transparent link for Ethernet protocols regardless of the higher level protocol. It is, therefore, transparent to protocols like TCP/IP, Modbus/TCP, or any protocol used over Ethernet. Support of the Spanning-Tree link management protocol prevents undesirable loops in case the modems are used to form a grid or ring network. -20 to +60°C and can be powered from any 18 to 60 Vdc (18.42Vac) power source. For mains power operation a power adapter is available. The modem is available as desktop version and as rack card for use in the UCF-16.3 and UCF-3.1 card frames. High speed modem for metallic lines. Data rates from 64 kbit/s up to 4608 kbit/s. IEEE 802.3 compatible 10baseT Ethernet interface. Automatic learning Ethernet bridge with Spanning-tree link management protocol. Configuration and control by: frontpanel, web browser, telnet connection, or serial port. SNMP support for control, monitoring and configuration (optional). Toggle switch for straight or crossed cable selection. 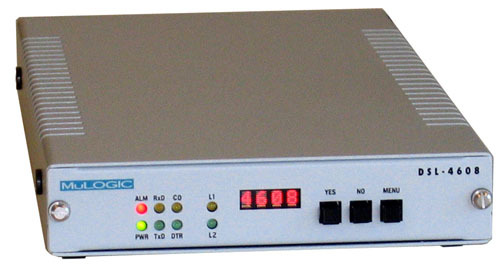 Isolated power supply input (ac and dc) for industrial applications. 18 to 60 Vdc (18-42Vac) supply voltage range. (Other ranges available on request). Be it for connecting just two Ethernet devices, for connecting a remote Ethernet device to a LAN or even for connecting two LANs, the DSL-4608S.Eth can be used for any device equipped with an Ethernet port: from Personal Computer to PLC. The DSL-4608S.Eth is 100% protocol independent. It will bridge Modbus/TCP, TCP/IP, AppleTalk, DecNet, Netbui, or any protocol that can be transported over Ethernet. Because of the automatic MAC address filtering, only those Ethernet packets destined for the remote end are send over the modem link. All other packets are blocked. In this way, no bandwidth is consumed by data traffic between devices at the same location of the modem. The DSL-4608S.Eth can be configured and controlled by means of push buttons on the front panel, via a serial command port, or via the network ports (Ethernet or line). For access via the network, both telnet and web browser protocols are supported. SNMP is available on request. For stand alone mains power (100..240Vac) operation, an external power adapter is available. The modem can be used in many environments. It is suitable for operating at ambient temperatures ranging from -20 to +60°C. Modem data rate: 64 to 2304 kbit/s on one pair, 128 to 4608 kbit/s on 2 pairs. 1-pair (2 wires) and 2-pair (4 wires) operation. 10baseT Ethernet: IEEE 802.3 compatible. Spanning-tree protocol: IEEE 802.1 compatible. MAC Address filter: automatic learning and ageing. Connection type: 10baseT UTP at RJ45 connector. 10baseT polarity detection: Automatic polarity reversal. TxD: Data transmitted to remote modem. RxD: Data received from remote modem. DTR: Local 10baseT link connected. L1: DSL line 1 connection status. L2: DSL line 2 connection status. LTx: Data transmitted from modem to 10baseT port. Lnk: 10baseT Ethernet link connected. Push buttons and 4 digit display for configuration at the front panel. Push button switch for selecting 10baseT straight or crossed cable. Serial config port: miniature 4-pin connector. Desktop: DSL4608S.Eth: 250x130x30 mm LxWxH, Weight: 995gr. - Rush-in current: Below operating current. CE marking: directives: 2004/108/EC and 2006/95/EC.